I’ve never been a huge fan of coconut, which explains why Samoas haven’t ranked among my favorites of all time, but in the past year or so I’ve really warmed up to the flavor. Maybe because I’ve been toasting it at home to adorn carrot cake cupcakes and cheesecakes, and the aroma is absolutely intoxicating, so I can’t help but like it more and more. The coconut flavor here is definitely a main player, and the sweet caramel and chocolate really do make for a fantastic combination. Ryan insists that the taste doesn’t exactly match the Scouts’ version, but he still gobbled them down without a problem! Because even if they’re not a perfect duplicate, you really can’t go wrong with a delicious shortbead crust topped with plenty of toasted coconut coated in sweet caramel and dipped and drizzled with semisweet chocolate. In the bowl of an electric mixer, cream together the butter and sugar until light and fluffy, about 2-3 minutes. In a medium bowl, whisk together the flour, baking powder, and salt. With the mixer on low, add the flour mixture to the creamed butter in 3 increments and scraping down the sides of the bowl as necessary. Add the milk and vanilla, and continue blending until mixture is just combined. Use your hands to form the dough into a disk, then wrap it with plastic wrap and place it in the fridge for about an hour. After the dough is chilled, preheat the oven to 350 degrees and prepare a baking sheet with a Silpat mat or parchment paper. Roll out the disk onto a lightly floured surface so it's about 1/8" thick. 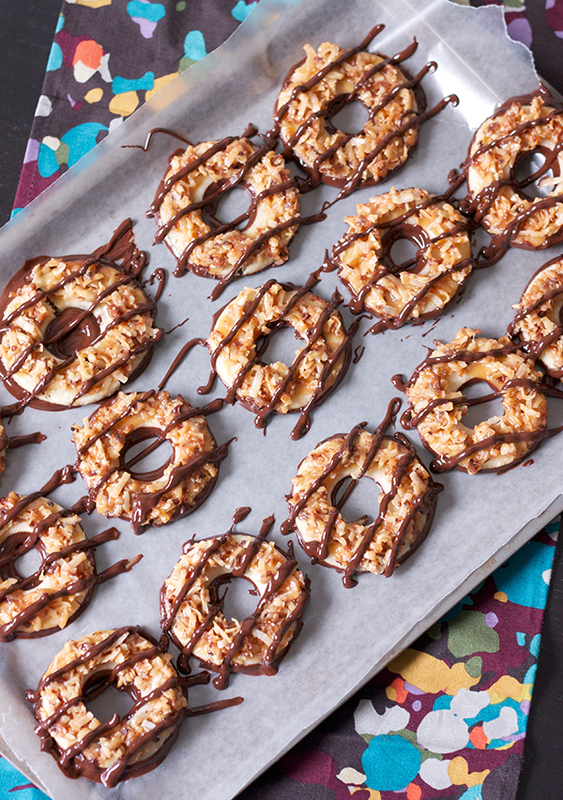 Use a donut-shaped cookie cutter (or 2 circle cutters - one larger and one smaller to make donut shapes) to cut out the cookies and transfer them to the prepared baking sheet. Bake the cookies for 10-12 minutes, rotating the baking sheet halfway through, until the cookies just start to turn golden brown (err on the side of underbaking here). Allow the cookies to cool on the baking sheet for 5 minutes, then transfer to a wire cooling to cool completely. In a dry medium saucepan, toast the shredded coconut over medium-low heat for 5-10 minutes. Stir frequently and be careful not to let it burn (make sure to keep your eye on it!). Remove from the saucepan and set aside. In a double boiling, melt the caramels, milk, and salt until the caramels are fully melted. 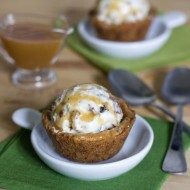 Remove from the heat and in a large bowl combine 3/4 of the caramel mixture with the toasted coconut. Spread the rest of the caramel on top of the cookies to act as a "glue", then press a bit of coconut mixture atop each cookie. (If the mixture gets too hard to work with, microwave it for 10 seconds or until it's spreadable again) Let the cookies/mixture cool and set for at least 30 minutes. Melt the chocolate in the microwave in 30 second intervals until smooth, stirring vigorously after each interval. Dip the bottoms of each cookie into the melted chocolate and place them on a wax-paper lined baking sheet. Drizzle the cookies with chocolate and place the cookies in the fridge for 10-20 minutes until the chocolate is fully hardened. hi, i have never been a big fan of coconut too, but your recipe may just convert me. What about converting me on coconut cakes / coconut cream pies too? These cookies look gorgeous–they’re absolutely perfect. I just recently took to coconut. I think it was a texture thing. I want one of these so bad. the cookies look delicious and crunchy, will try these soon. These look EXACTLY like the originals and I bet they’re just as delicious too! Great job Erica! Hi Erica! I’m a new reader and I’m so glad I’ve found your blog. 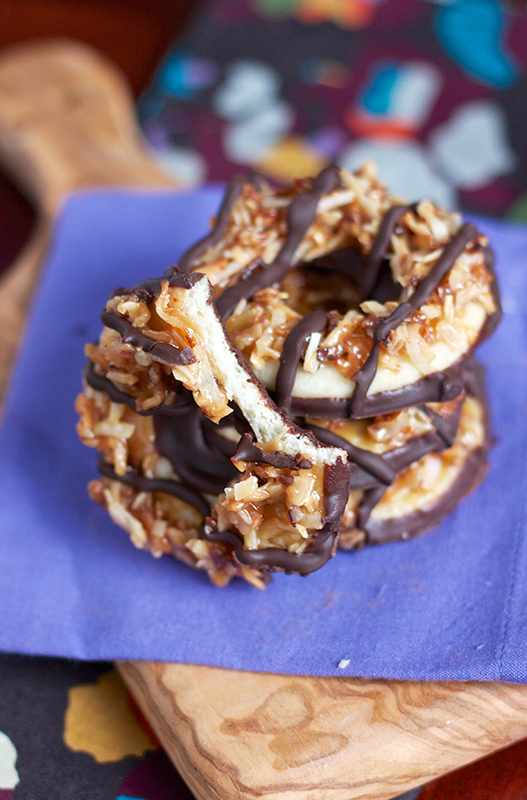 These Samoas look fantastic. They were always my favorite Girl Scout cookie, but I love that I’ll be able to make these for myself year round, even when it isn’t Girl Scout cookie season. Erica, this is my first time here. 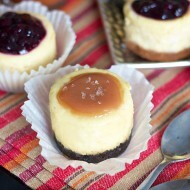 I found you through a Google search for “blackberry cupcakes” lol and I am so glad I found you. 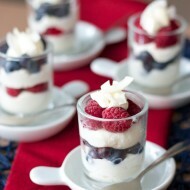 I love your blog and your recipes look yummy. Like these cookies. I love coconut anything so these are amazing! 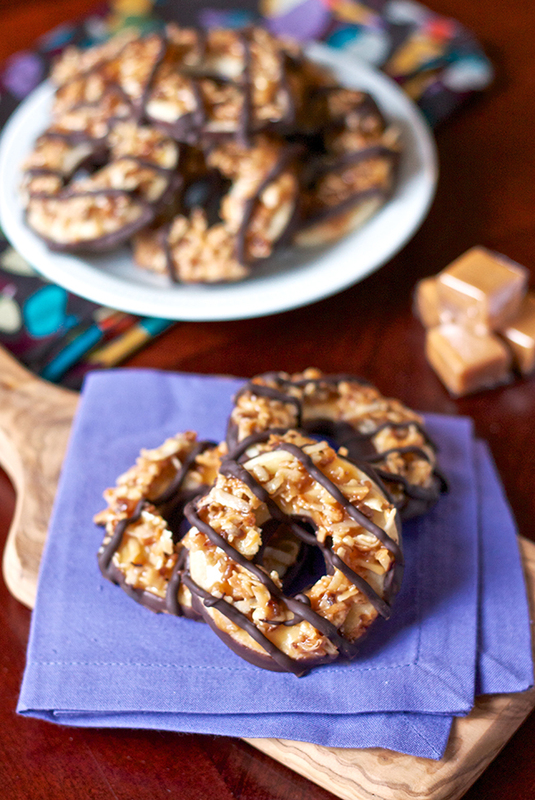 Girl scout cookies are a weakness, really enjoy this recipe thanks for sharing. I just made these… Took about 5 ish hours and made a total mess! I am not an inexperienced baker, what did I do wrong?? I’m so sorry to hear that! I definitely made a mess of my kitchen because there were a lot of steps, but what happened specifically to the cookies?